Dr. Seuss from Then to Now: A Catalogue of the Retrospective Exhibition is for Ages 9-12. Dr. Seuss from Then to Now: A Catalogue of the Retrospective Exhibition was written by Dr. Seuss. 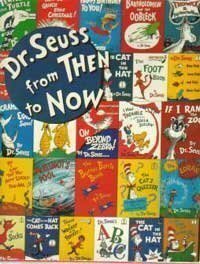 Dr. Seuss from Then to Now: A Catalogue of the Retrospective Exhibition was published by Random House Books For Young Readers. Subjects of Dr. Seuss from Then to Now: A Catalogue of the Retrospective Exhibition include 20th century, Children's 4-8, Children's Books/Ages 4-8 Fiction, Children: Grades 4-6, Dr, Dr., Exhibitions, General, Illustration of books, Juvenile Nonfiction, Non-Classifiable, Readers - Beginner, Seuss, Seuss,, and United States. About San Diego Museum of Art (Compiler) : San Diego Museum of Art is a published compiler of children's books. A published credit of San Diego Museum of Art is Dr. Seuss from Then to Now: A Catalogue of the Retrospective Exhibition.